The Product List does not constitute an endorsement of one product over another. Products have been listed based upon the percentage of saturated fat and then alphabetically. Choosing the product with the lowest percentage of saturated fat will result in the healthiest end product. This list may not include all products in compliance with the BC trans fat regulation, ask your supplier or check the product label to determine compliance of products not listed. The Product List has been adapted with permission from Alberta Health Services – Calgary Health Region with the assistance of Richardson Oilseed Ltd. 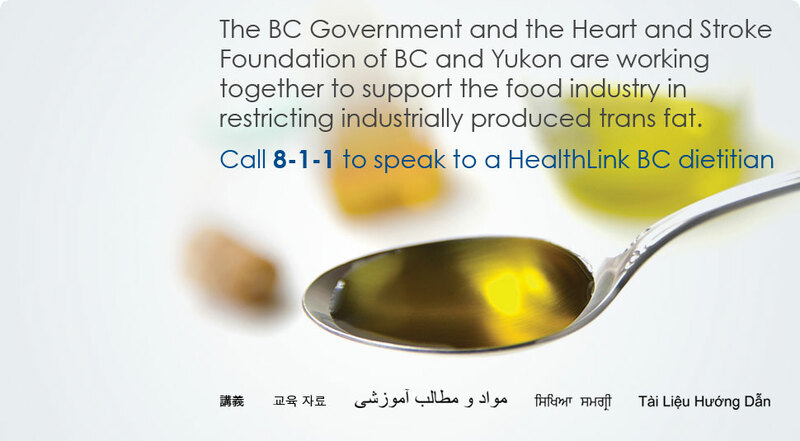 If you would like to submit a product that meets the trans fat restrictions and fits into one of the categories listed above, download the Product List Application or email us at restricttransfat@gov.bc.ca.